It is the last few days of the landmark exhibit at Matthew Marks Gallery in Chelsea through April 17th. 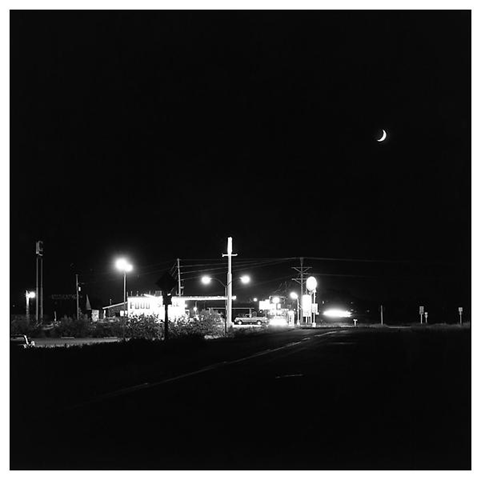 Often cited as the best modern landscape photographic artist, Robert Adams has these 50 photos, taken walking around various 70’s Colorado suburban scenes, on display once again. The exhibit has the range of evocative emotions from the prosaic to the profound. The exhibit requires time to really absorb the various low light dimensions of the work. A solemn, even foreboding, mood is established or is it just relaxed observation … or both? Shadow and light play with the viewers senses as abstract forms appear out of the darkness. Robert Adams leads the viewer outwards in these photographs from the populated center of the suburban town towards the rustic plain and distant Rocky Mountains. During his evening perambulations the photographer captured trees and houses, mountains and streets, fields and sidewalks between dusk and approaching dark. Lit by the setting sun, street lamps, and moonlight, his compositions are never conventionally beautiful. They vacillate between quiet foreboding and tranquil domesticity and, as the photographer has expressed in his own writing, attempt to capture the timelessness and peace of warm summer evenings. A new Aperture edition of these photos is also now available if you fail to make the closing of this important exhibit.